Grapevine is an economically important fruit crop, covering an area of 17,200 hectares and producing 281,000 tonnes of berries in Korea (http://www.krei.re.kr). In September 2010, inner necrosis of berries and poor fruit set were found in grapevine cv. Tamnara (Vitis viniferax x V. labrusca) in Siheung, Korea. Approximately 1.7% of the 300 vines were affected. The berry symptoms resembled those reported for Grapevine berry inner necrosis virus (GINV) in Japan (Imada, 2002), although necrosis in shoots, shortened internodes and mosaic patterns on leaves were not observed. To confirm the presence of the virus, leaves and berries of symptom-bearing vines were collected and tested by reverse transcription (RT)-PCR. Total RNA was extracted with the robotized NucliSENS easyMAG system (bioMérieux, Boxtel, The Netherlands). DNA fragments (478 bp) were amplified from the samples by RT-PCR using primers (5’- TTGTCTGATGGCTCTGATG-3’, 5’-ACAGTTGATAGACAGGTGG-3’) described by Imada (2002). The fragments were cloned into pGEM-T easy vector (Promega, Madison, WI) and sequenced. BLAST analyses of the obtained fragments revealed 93% nucleotide sequence identity with Grapevine Pinot gris virus (GPGV; Accession No. FR877530) and 60% nucleotide sequence identity with Grapevine berry inner necrosis virus (GINV; Accession No. D88448). On the basis of the GPGV sequence, primers (5’-ATGTCGATTCGTCAGGAGCTG-3’, 5’-CTACATACTAAATGCACTC-3) were designed and used to amplify the coat protein (CP) gene of GPGV. The expected PCR fragments of 588 bp were obtained from the cv. Tamnara samples. After cloning and sequencing the fragments, BLAST analysis of the sequence (GenBank Accession No. AB731567) revealed 97% identity to the CP gene of the previously-published GPGV sequence. RT-PCR for Grapevine fanleaf virus (GFLV), Grapevine leafroll-associated virus-1 (GLRaV-1), -2 (GLRaV-2) and -3 (GLRaV-3), Grapevine virus A (GVA) and Grapevine virus B (GVB) did not yield any specific products from the GPGV-positive samples. GPGV was first described in grapevine cv. Pinot gris in Italy (Giampetruzzi et al., 2012) and identified as a provisional new species in the genus Trichovirus. To our knowledge, this is the first report of GPGV infection of grapevine hybrid in Korea. 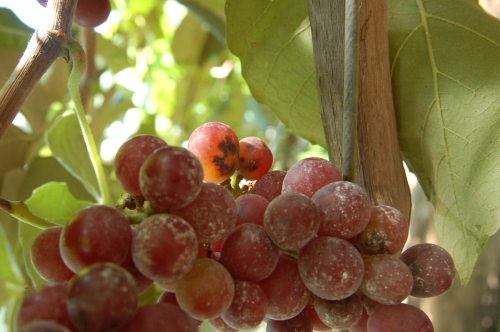 Figure 1: Symptoms of grapevine berries infected with GPGV. Figure 2: Symptoms of grapevine berries infected with GPGV showing inner necrosis. This work was carried out with the support of "Research Program for Agriculture Science & Technology Development (Project No. PJ006358)", Rural Development Administration, Republic of Korea. Imada J, 2002. Grapevine berry inner necrosis. In: Ieki H, eds. Virus and Viroid Diseases of Fruit Trees [In Japanese]. Tokuo, Japan: Nobunkyo, 76.